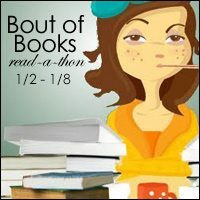 Bout of Books 18 starts today, and I’ll be tracking my progress in this post. As I mentioned in my sign-up post, my goals are to read at least two books and participate in at least one Twitter chat. If I pick shorter books, I should be able to do it! Happy reading, everyone! Books completed: Crosstalk by Connie Willis and The Hating Game by Sally Thorne. I read most of Crosstalk on January 1, so I won’t count it toward my goal of two books during Bout of Books. But I really enjoyed the book, so it was the perfect way to kick off this readathon! I also LOVED The Hating Game and will definitely be reading Thorne’s next novel, which comes out this summer! Currently reading: I’ll be starting Alan Bradley’s latest Flavia de Luce novel, Thrice the Brinded Cat Hath Mew’d. Books completed: Crosstalk by Connie Willis; The Hating Game by Sally Thorne. Currently reading: About to start Thrice the Brinded Cat Hath Mew’d by Alan Bradley. Currently reading: Thrice the Brinded Cat Hath Mew’d by Alan Bradley — hoping to finish tomorrow! Books completed: Crosstalk by Connie Willis; The Hating Game by Sally Thorne; Thrice the Brinded Cat Hath Mew’d by Alan Bradley. Currently reading: I’m starting Belgravia by Julian Fellowes. Currently reading: Belgravia by Julian Fellowes.